It’s home to the world’s second largest migration of animals, an epic movement of antelope through some of Africa’s most pristine wildernesses. But there is not a single tourist in the vast expanse and stunning scenery of Badingilo National Park to see it – not yet, anyway. Wildlife suffered but many populations did survive, and now the fledgling government is working to conserve and develop what remains. “People were amazed when it was found after the peace signed in 2005, that the wonderful wildlife that had survived was so great,” said General Alfred Akwoch, adviser to the South’s Wildlife, Conservation and Tourism Ministry. “The nature and wildlife is great treasure to conserve,” he added, speaking at a ceremony on Wednesday for the opening of the first infrastructure to be built for Badingilo park – an administrative headquarters. Women ululated and men danced as the ribbon was cut to mark the centre’s opening, set in a wooded area close to the White Nile river, some 85 kilometres north of the south’s capital Juba. “There are no wildlife migrations like this in Africa, apart from the wildebeest migration in Tanzania and Kenya,” Mr Akwoch said. Badingilo is home to giant herds of antelope – including tiang, white-eared kob and reedbuck – as well as giraffe, lion, cheetah and vast bird populations. 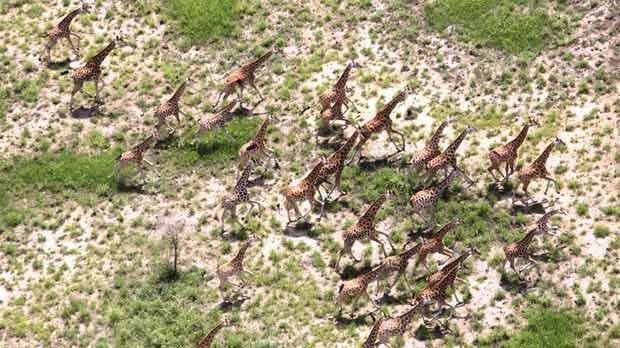 “South Sudan is blessed,” said Paul Elkan, who heads the Wildlife Conservation Society in the south, which is supporting government efforts to set up parks. “If well managed, and with proper care, it could become the largest migration,” he added. The WCS has been gathering data on animal movements, including via aerial surveys and tagging through electronic collars. “We found that the years of war had also created some buffers” for the animals, Mr Elkan said. Badingilo park, vibrant green from recent rains, stretches over 10,000 square kilometres. But the wilderness spreads much further – it is the largest area of intact savannah eco-system left in east Africa – and an extension of the park by up to three times its current size has been proposed. Nor is it the only park: The South has 16 national parks or protected reserve areas, one of them the size of Rwanda, Mr Elkan said.